Some Sindy collectors view 1974 with mixed feelings. This year is the last year that we see the Trendy and Gauntlet Sindys and for some collectors this is where their collecting ends. For others, during the course of year where we see new dolls replacing the earlier versions, this is where their collecting begins. By far the most important release of the year was Active Sindy. Pedigree's most poseable doll to date. Active Sindy or Ballerina Sindy was a breakthrough in terms of design, in particular her wrists, arms and legs posed but her limbs were enclosed in vinyl so she did not have the unsightly elbow and knee joints that are often found on poseable dolls of the period. Active Sindy was the most popular doll Pedigree ever made, and Active Sindys (or Ballerinas) became part of the product range every year until the demise of the Pedigree Sindy. Top Pop continued to be sold, now shown in the Pedigree literature wearing the flowery purple version of the outfit rather than the prototype. The trade catalogue emphasised that she was an “all-action Sindy” (see 1973 Sindy). The Trendys were phased out and those left were sold as Sindy Apple with a new reference. The Gauntlets were phased out and we think by the end of the year were replaced with a new Lovely Lively model. The new Lovely Lively was not shown in either the trade catalogue or the style leaflet The new dolls had remodelled heads and bodies including Active Sindy limbs and their hair was made of saran which was less fragile than the old Sindy hair. 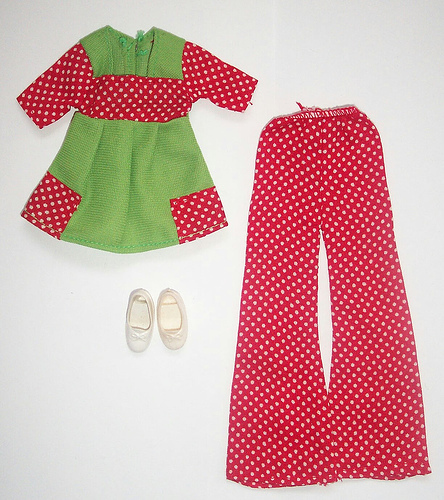 We believe that both the old and the new models of the Lovely Lively were sold in the original polka dot jumpsuit which was now called 'Fun Flares' but with the same reference, and a new outfit called 'Ship Ahoy' which replaced the pretty drop waist dress (see 1973 Sindy). Funtime Sindy was sold under a new reference. The doll shown in the trade catalogue was the original fat legged Funtime, but this doll was also remodelled with thinner legs and a twist n turn waist. Similar to Lovely Lively we think the fat legged dolls were phased out and the newer model replaced them during the year. 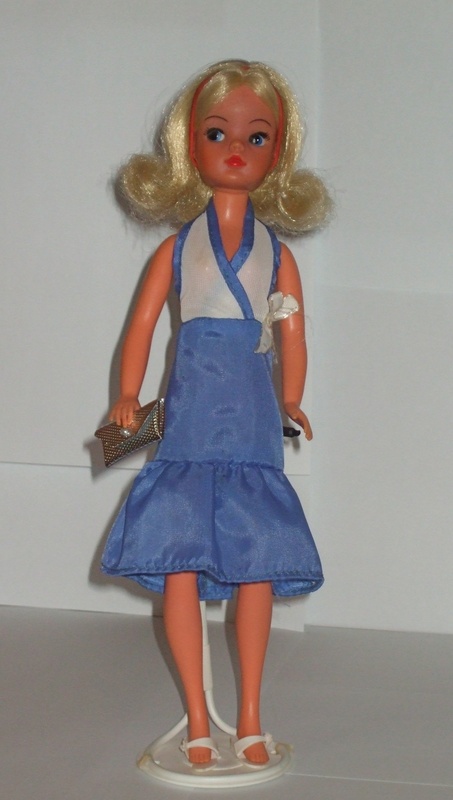 This thin legged doll was not described in either the trade catalogue or the style leaflet and in fact the Funtime Sindy was not referenced in the Pedigree Sindy style leaflet at all. Active Sindy was introduced and was described as “The most exciting new development in dress up dolls for years.” She was designed to pose in virtually every position as the human body – except in 1974 in a bid to get the dolls into the shops she was sold without posing ankles, so she could sort of execute ballet positions 1 to 5 but she could not be posed “en pointe”. The Sindy shown in the Pedigree literature was a prototype and the ones actually sold were slightly different, this is most noticeable when you look at the 1974 catalogue pictures of her neck and face. Apart from two Active Sindy tutus and a Lovely Lively 'Ship Ahoy' dress (see each outfit below), most labels that we have found are the usual printed green on white paper label which said “Made in Hong Kong” in a green edged box. However, we have also found that some of the new outfits have a different paper label which says “MEGO® MADE IN HONG KONG”. Some of these labels also include a copyright symbol and a year as shown in the photo above. Mego was a huge US/HK toy manufacturer and marketing company. In the 1970s they sold their own product lines in the USA and sometimes through other companies into other markets. They had expertise in making 11½ inch fashion dolls and outfits, and the company had its own teenage fashion doll called Maddie Mod. In addition a number of companies, including Pedigree, used Mego in Hong Kong to manufacture their own doll's outfits. In 1973, Mego stopped manufacturing the Maddie Mod doll however some of her outfits shown in her 1973 catalogue are almost identical to later Sindy outfits and given that Pedigree had previously repurposed Marx products to add to Sindy Scenesetters (see both 1972 and 1973 Scenesetters) it is not unsurprising that perhaps with the demise of Maddie Mod they saw another opportunity to effectively add to Sindy's range of outfits. Although is now probably impossible to completely identify with certainty which outfits were Pedigree UK designs made by Mego, and which were designs Mego had created for their own dolls which were adopted and adapted for Pedigree's Sindy, the presence of a Mego label might perhaps indicate that it was originally a Mego design. We will point out the Mego labelled garments and also those outfits we have found in Maddie Mod literature which we think were adapted for Sindy in the descriptions below. As these labels were made of paper, it is quite likely that there were other outfits which were manufactured by Mego which we haven't spotted yet. Do let us know if you find any of these, we would also be keen to hear from any Maddie Mod collectors who have knowledge of the 1970s outfits. With regard to the fastenings all the new fashions had sewn-on metal snap fasteners. The Fun Fashion outfits were also still available, but three of them were slightly updated - see below. As with previous years we know that additional outfits were released as the year progressed and as before we will continue to show them in the year that they are referenced in the Sindy marketing literature, i.e. the Pedigree trade catalogue and/or the Sindy style leaflet/brochure. However we are including one additional outfit for 1974 because it was not referenced in either the 1974 or 1975 Pedigree literature. We think this outfit was worn by both the old style Gauntlet and the newly remodelled Lovely Livelies (shown above). The outfit consisted of a blue cotton pinafore dress with an embroidered flower motif stuck onto the bib and long shoulder straps which went over the shoulders and were sewn onto the back of the skirt at the waist. The pinafore fastened with one sewn-on metal snap fastener at the back of the waist. The long-sleeved top was made of white textured nylon with a turtle-neck. It was open down the back and fastened at the back of the neck. The dress had a red printed “Made in Hong Kong” paper label. We believe this Sindy came with white Trendy shoes, a golden medallion charm bracelet, and she wore a blue rubber elastic headband. The flower motif is different to the one shown in the Pedigree literature. And there are two versions, one has a white embroidered flower picked out in red embroidery, and the other a red embroidered flower picked out in white embroidery. We do not know if there was any significance to the colour of the flower. We currently have a question mark over the tops. The one that is most often found had elasticated cuffs and unusually a large metal popper covered with a white plastic cap which fastened at the back of the neck, but we also have another version of the top which was made of the same white nylon fabric with a sewn-on metal snap fastener, and another the same but it with sewn-on cuffs. We have have also heard that it came with straight cuffs. We would like to know what other collectors have found, so please do get in touch. Surprisingly we have had some difficulty with this outfit and establishing it exactly, particularly as all the accounts of this outfit that we have read vary slightly from each other and from what we have, so if other collectors could add to or confirm this description we would be pleased to hear from them. We would be particularly interested to hear from any collector who has had the opportunity to compare these outfits side-by-side as we understand that there might be size differences and we would be keen to know if there was anything significant we should note. Collectors should also note that there is a Florido Spanish Sindy outfit called 'Flor' ('Flower') which is very similar to this outfit and which came with blue Trendy shoes. But, the material is slightly different and it has two guipure lace flowers sewn to the bib rather than the large embroidered flower. The easiest way to tell them apart is that the Florido outfit fastens with velcro and not a metal popper or snap fastener. This outfit was used to sell the last of the Trendys. 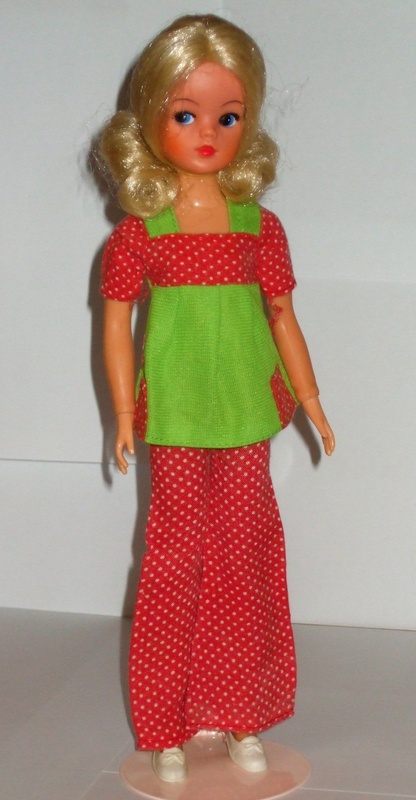 Her top was the same as that sold in 1973 but her trousers were now just plain red cotton (see 1973 Sindy). We believe that she still came with a golden medallion charm bracelet, and was still shown wearing white Trendy shoes and a rubber elastic headband which is also shown as red. Sindy's ballet costume consisted of a white leotard, tights and a detachable tutu so that she could also be a gymnast or a dancer in rehearsals. It does not look like the version shown in the Pedigree literature which was a prototype like the doll itself. The short-sleeved leotard was made of white stretch-nylon, it had a scoop neckline to the front and deep V-shaped back. The whole of the neckline was trimmed with a white satin binding. On her legs she wore a pair of thick white nylon fishnet tights. Her tutu was made of three layers of lilac honeycomb netting with an additional top layer of a very fine white translucent netting trimmed at the hem with white lace. The white lace is interesting in that on the majority of lilac tutus we have inspected the lace is nylon however we have two which are almost identical but the lace is made of cotton, these tutus also have paper labels which say “MADE IN HONG KONG”. One is printed in black ink and one is printed in red and we think these must be the earlier versions. The waistband was made of a white satin binding and it fastened at the back of the waist with one sewn-on metal snap fastener. For Sindy's feet she had a pair of moulded white plastic ballet shoes with white silk cord ties and for her hair a lilac satin ribbon (shown in photo below). The Funtime doll was shown the Sindy trade catalogue but not in the style leaflet. She was shown with fat legs and the striped swimsuit but without the wraparound skirt (see 1973 Sindy). But at some point this doll was updated to the thin legged model shown above. These dolls did not come with the golden medallion charm bracelet. Although not shown in the Trade catalogue, we think they still came with white Trendy shoes and a red rubber elastic headband. Sindy's first bridal gown was quite traditional looking. It was made of shiny white nylon with long leg-of-mutton sleeves and a high sewn-on turtle-neck collar. The bodice was shaped at the front with two darts at the waist, and it had a square-shaped yoke trimmed with white nylon lace which went over the shoulders finishing at the back opening in a V-shape just below the shoulder blades. The long skirt was very full and around the hem at calf-height there was a band of white nylon cut-out lace. Attached to this was another layer of pleated white translucent nylon. The dress fastened at the back with two sewn-on metal snap fasteners. For her head Sindy had a long stiff honeycomb net veil which reached down to the back of her knees. It was attached to a headband made of three white guipure lace flowers attached to an elastic cord. The backing to Sindy's bouquet consisted of three layers of lace, a white tulle embroidered with flowers overlaid with a layer of pleated turquoise translucent nylon and on top the same honeycomb netting as the veil. Arranged amongst this intricate backing were five plastic flowers on a green plastic stalk. The flowers were normally blue, pink, red, white and yellow (although we have seen variations to these colours including variegated flowers which have been more that one colour e.g. pink and white). There was a long white silk ribbon at the back of the bouquet and a little cotton covered elasticated loop to attach the bouquet to Sindy's hand. For her feet Sindy was given a pair of square-toed white plastic shoes with a moulded buckle. We understand that there was also cream coloured variation of this outfit (not shown), and we have also found variations in the lace trim as shown below - the dress on top has a different lace trim to that shown in the main photo which is the same as the dress at the back. A beautiful nightie and dressing gown set with furry slippers. The material was made of an open woven cotton a bit like cheesecloth or muslin printed with a delicate floral pattern with pink and lilac flowers edged in a darker pink with little green leaves on a white background (it is a slightly different pattern to that shown in the 1974 Pedigree literature). The floor-length nightie had a elasticated smocked bodice and pale pink nylon and cotton lace shoulder straps. The same lace was used to decorate the the hem of the nightie, which fastened at the back with one sewn-on metal snap fastener. The long-sleeved dressing gown was made of the same floral fabric and was decorated with the same pink lace around the collar and down the front to the waist. The pink lace was also used to decorate the hem. The dressing gown fastened at the front of the waist with one sewn-on metal snap fastener decorated with a sewn-on nylon bow usually pink. The slippers were Sindy's white daisy sandals but they were decorated with a small strip of deep pink fluffy fake fur. There is a well known variation to this outfit. It had a completely different floral pattern decorated with little pink and pale yellow flowers and green leaves on a white background. It was still trimmed with the pale pink lace. We do not know for certain what the shoes for this variation were but they were possibly white daisy sandals. We have also found slight colour variations to this outfit which we think are merely the result of different fabric dye batches and also to the colour of the nylon ribbon used for dressing gown. This three piece outfit is another collector's favourite. The jacket was made of fine ribbed navy blue nylon material trimmed with sewn-on lapels, cuffs and two patch pockets at the front made from a wavy zig-zag striped nylon crimplene. The jacket fastened at the front with two sewn-on metal snap fasteners and on top of each snap fastener was a little white plastic button (the same buttons that were used for the 1973 'Fun Fashion' 'Sleeveless Dress'). The above-the-knee A-line skirt was made of the same wavy zig-zag material. It had a deep front pleat (about 1¾ inches long) with additional stitching detail above the pleat running each side of the middle front seam to the sewn-on waistband. It fastened at the back of the waist with one sewn-on metal snap fastener. For her head the wavy zig-zag fabric was again used to make a wide brimmed hat. The underside of the brim was trimmed with the navy blue jacket fabric. To complete the outfit there was a navy blue saddle-shaped shoulder bag made of textured vinyl which fastened with one dome-shaped white painted metal popper (we believe it is the same bag as was used for 1972 'Blazer Way'). This outfit also came with shoes and a pair of sunglasses with big round rose-tinted lenses in a white plastic frame (the same as used for 'Winter Sports' see 1971 Sindy) however please see the paragraphs below. We have two variations of this outfit. The Sindy without glasses is wearing a version where the wavy pattern is aqua blue, purple, white, greenish yellow, then the same aqua blue. The Sindy in the glasses is wearing the other colour combination which are navy blue, creamy yellow, white, aqua blue, then navy blue. We did wonder if the differences were due to fading however both these outfits are pristine so we did wonder if the variation is merely the result of different fabric printing batches. "I have been comparing the outfit with the navy one and have noticed that the fabric of the maroon jacket has a slightly different weave pattern to the navy one; whereas the navy one has a linear weave pattern running from top to bottom, the maroon one has an oxford/pinpoint weave pattern. Also, the navy fabric has a silkier feel to it than the maroon one." This makes us think we are dealing with a man-made fabric which has simply changed colour with age. And, depending perhaps on the method of production, some fabrics have retained their 'Wavy Navy" colour and others have discolored, providing collectors with another variation collecting opportunity. This outfit was available in both 1974 and 1975 and establishing this outfit definitively has also proved to be very difficult. There are a number of accounts regarding it but they all differ slightly as do the Pedigree photos for 1974 and 1975. Firstly the 1974 Pedigree literature and some references show or describe the jacket without buttons however we have carefully inspected a number of jackets and all of ours have buttons or evidence of buttons which have probably fallen off. Secondly, the accounts differ as to the shoes, the majority of references refer to white Trendy shoes however we have also seen references to blue Trendy shoes and also to the square-toed white plastic shoes with a moulded buckle – we have opted therefore for white Trendy shoes because we have seen these in a photo of the 1975 NFRB (Never Removed From Box) version. Lastly, the sunglasses are not shown in the 1974 Pedigree literature but they are shown in 1975 and it is commonly believed that the sunglasses were a 1975 addition. In the absence of any NFRB (Never Removed From Box) versions from 1974 we cannot confirm whether there were any real differences and if any collector has this boxed outfit we would be very pleased to hear from them so that we can update this description. A very pretty pinafore style maxi-dress with a square neckline, frilled cap sleeves and a matching frill around the hem. This dress was made of a stiff man-made fabric woven with a silver thread. Applied to the top surface was a velveteen layer which gave the fabric a really beautiful geometric pattern of oblongs and squares. It fastened at the back with two sewn-on metal snap fasteners. 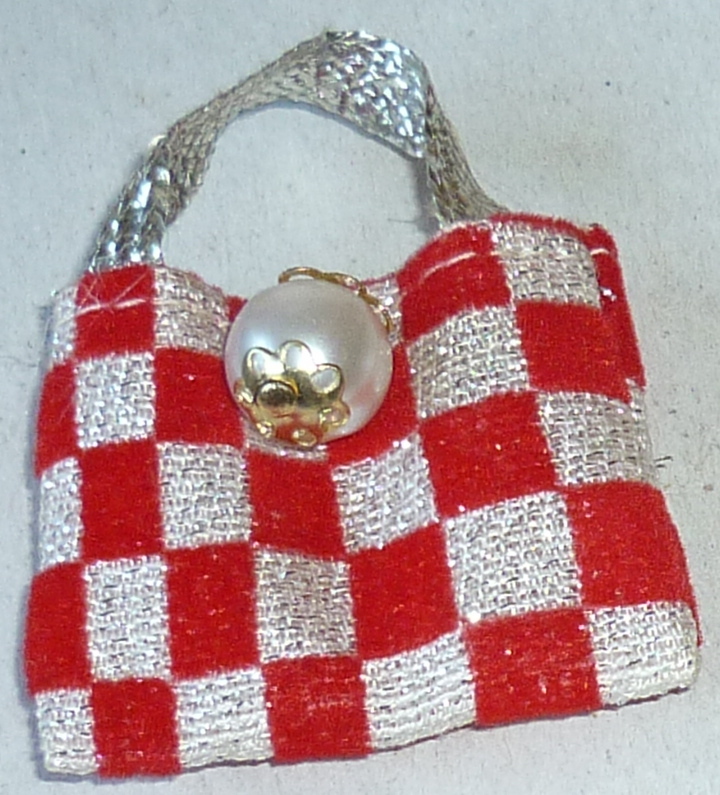 There was a matching handbag decorated with a pearl bead with gold coloured filagree bead caps and a silver woven fabric handle. 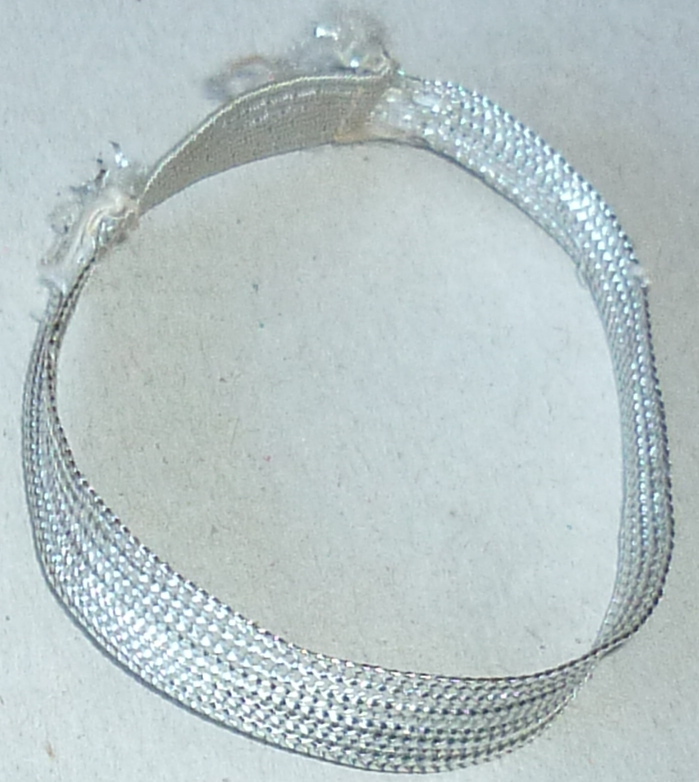 There was also a matching silver headband (shown below and above right) and a pearl necklace with a silver box clasp (shown above left). The outfit came with white daisy sandals. There are two variations of this glamorous outfit, one is the more common orange and silver version, and there is also a much rarer red and silver variation. This outfit was called 'Checkmate' in the 1975 Pedigree trade catalogue. This outfit consisted of a knitted jacket (which looks a bit like a chunky knit cardigan) and white trousers. The long-sleeved jacket was made of a gaily patterned zig-zag vertical striped woven nylon/crimplene thread in predominantly brown, white, navy blue, red, orange, yellow and black colours (because of the fabric the patterns do vary slightly). It had a sewn-on collar with reverse lapels, and two shallow hand patch pockets sewn with the stripe on the horizontal on the bottom edge of the jacket at the front. It fastened at the front with three metal sewn-on metal snap fasteners each decorated with a little red plastic button. The flared trousers were made of a thin white nylon. They fastened at the back with one sewn-on metal snap-fastener. Although the outfit was shown with white Trendy shoes we have seen it MIP (Mint In Packet) and it came with white daisy sandals. In some packets there was also a little gold clutch bag which was not shown in the Pedigree literature. We do also have exactly the same white trousers but they are made of white cotton rather than white nylon. 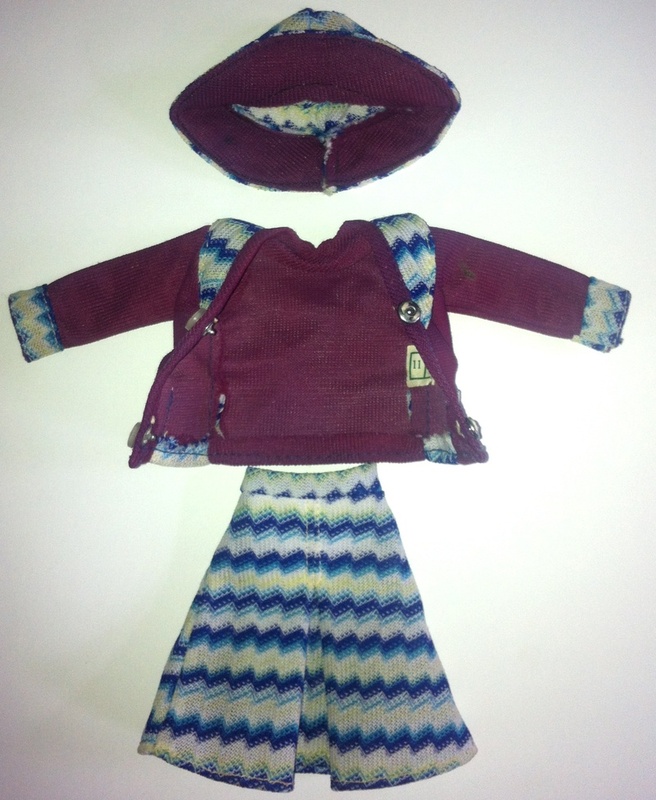 We do not know if cotton trousers were also used for this outfit and we would like to know whether other collectors have also come across them? This outfit has a Mego label and a similar outfit also called 'Blazer Beauty' (Ref 2758) was shown in the Maddie Mod catalogue for 1973 and on contemporary Maddie Mod packaging as 'Blazers' In' (Ref 2234). Collectors should also note that there is a Florido Spanish Sindy outfit called 'Fantasia' which is very, very similar to this outfit and which did come with white Trendy shoes. But, the jacket has slightly different colours and the material was similar to that used for the front panel of the jumper from the 1975 Sindy outfit 'Jumper n Jeans'. By far the easiest way to tell the outfits apart is that the Florido outfit fastens with velcro and not metal snap fasteners. A very pretty calf-length nightie made of two layers of nylon stitched together. The top layer was made of a white translucent netting embossed with soft pastel flowers and butterfly outlines. The layer underneath was made of white translucent netting embroidered with a vertical trellis design in a sugar pink silky thread. The edges of the nightie were trimmed with white cotton lace. The nightie had lemon yellow ribbon straps decorated with small yellow bows where they were attached to the front of the nightie. It fastened at the back with one sewn-on metal snap fastener. This outfit came with a pair of white daisy sandals. Some outfits have been found with an additional uncatalogued set of underwear consisting of a bra and pants. They were made of yellow nylon. The bra was trimmed with white cotton lace and had a piece of cotton elastic at the back. The pants were plain with an elasticated waist. We are unsure whether this set was widely available for purchase as some original owners have said that their negligee outfit which included the additional underwear set was a competition prize. The nightie has a Mego label and was shown on Maddie Mod packaging as an outfit called 'Sweet Dreams' (Ref 2235). Perfect for a cold day Sindy was given the latest in fashionable jumpers with a large roll-neck. The white jumper was an acrylic knit, it had long sleeves and a high roll-neck. The jumper was decorated with three bands of a contrasting navy blue knit near the bottom of each sleeve and around the bottom of the body (the 1974 Pedigree literature version is not quite so chunky looking and it did not have the three bands on the sweater body). The flared trousers were made of cotton, printed in navy blue with fine white diagonal stripes. The trousers were trimmed with two sewn-on white plastic buttons positioned on the front of the hips and the waist and trousers hems were stitched with a contrasting white cotton thread (see inset photo above right). The trousers fastened at the back with one sewn-on metal snap fastener. Although the outfit was shown with white Trendy shoes, we have seen it MIP (Mint in Packet) with white daisy sandals. This outfit has a Mego label and a similar outfit (but without the "M" shown on the jumper in the illustration) was called 'Sweater Weather' (Ref 2769) and was shown in the Maddie Mod catalogue for 1973 and also on contemporary Maddie Mod packaging as 'Knitty Gritty' (Ref 2230). Again collectors should note there is a Florido Spanish Sindy version called 'Nieve' which appropriately translates into English as 'Snow'. Unfortunately we don't have this version so we are unable to document the differences and we would be pleased to hear from any collector who does have it, so that we can complete this description and record any differences. This sleeveless halter neck dress had a white cross-over bodice made of nylon. The edges of the cross-over bodice were bound with a sky blue cotton binding. The same sky blue material was used for the skirt which had a deep knee-height frill made from the same material. Although it was not shown in the 1974 Pedigree literature the dress was decorated with a white nylon bow sewn to the waist. The dress fastened at the back of the neck with one sewn-on metal snap fastener and there was another sewn-on metal snap fastener at the back of the waist. Although the outfit was shown with blue Trendy shoes, we have it MIP (Mint In Packet) and it came with white daisy sandals. It also came a little silver clutch bag which was also not shown in the Pedigree literature. We think this was an adaptation of a Mego Maddie Mod dress which was made in green rather than blue and which was called 'Irish Eyes' (Ref 2226). A funky sleeveless jumpsuit made of a strange floral slippery nylon which has been described by others as shower cap or shower curtain material, both of which we think are very apt descriptions. It was trimmed with red stiff nylon binding around the neck and armholes and it had a red textured and ruffled stretchy nylon waistband panel. This same material was used to provide the large ruffled frills around each ankle. It fastened at the back with two sewn on metal snap fasteners. We believe it came with white daisy sandals. We have not seen the pattern shown in the 1974 Pedigree literature, but we do know of two variations as shown above. The first version has scarlet and lemon flowers with green leaves on a white background, and the second variation has brown and orange flowers with green leaves on a white background. This distinctive jumpsuit can also be found in Maddie Mod literature where it is called 'Pantastic' (Ref 2233). This was a simple, very pretty outfit and it consisted of a yellow smock top and trousers. The short-sleeved, square-necked top was made of a bright sunshine yellow nylon with a contrasting yolk made of orange and small white polka dot cotton. The polka dot material was also used to decorate the bottom corners of the front of the smock with two faux patch pockets. The top fastened at the back of the neck with one sewn-on metal snap fastener. The wide-legged trousers were made of the same orange and small white polka dot cotton and they had an elasticated waist. We have shown this outfit with white Trendy shoes we have now seen it MIP (Mint In Packet) with white daisy sandals. We have seen a variation to this outfit where the polka dot fabric is red rather than orange and we have read that there are other colours such as blue. Shown below is a very interesting variation with a lime green and red & white polka dot colour combination. We are showing you both of these photos because the inset photo below also gives you the opportunity to see the elasticated waist of the trousers. We would be pleased to hear from collectors who have any other variations that they would be happy to show here (duly acknowledged). Our outfits do not have labels, but this outfit was shown on Maddie Mod outfit packaging from the 1970s where it was called 'Love Story' (Ref 2237), so we think this outfit might have been another Mego adaption and adoption by Pedigree UK for Sindy. This outfit was called 'Casual Days' in the 1975 Pedigree trade catalogue. Finally, below is a MIP (Mint In Packet) 'Casual Day' in 1975 packaging. It is authentic, but it has the 1974 S227 reference, and it has never been opened. But, as you can see, it is a completely different outfit. It is a bit of a puzzle. Is it actually 'Casual Day'? Is it a production line error? Or, did Pedigree need to complete an order and sourced a substitute? 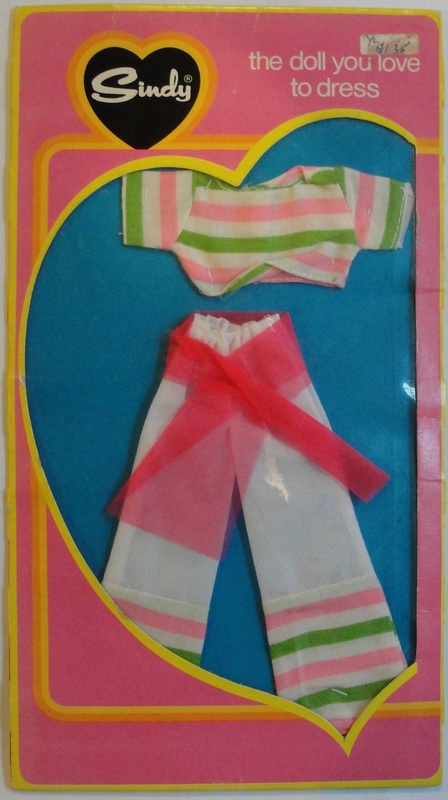 All we can tell you is that the candy stripe fabric was also used for a German teenage doll fashion from the Alme “Boutique Kleider” range (which translates into English as “Boutique Clothes”) which we believe was also made by Mego. What is certain is that this item is so extraordinary that it fully deserves its place in the Sindy Museum. A blue and white cotton polka dot knee-height dress with long sleeves. This waistless dress had a round neck and was made up of three tiers of fabric with the first attached to the yoke at breast-height and then each subsequent tier tucked and sewn to the one above. Each tier was slightly wider giving a bell-shape to the dress. It was trimmed with white nylon lace around the neck and on the edges of the sleeves. Although it was not shown in the 1974 Pedigree literature the dress was decorated with a white nylon bow sewn to the seam between the bottom two tiers of the dress. The dress fastened at the back of the neck with a sewn-on metal snap fastener. The outfit was shown in the Pedigree literature with blue Trendy shoes, we have seen it MIP (Mint In Packet) and it came with white Trendy shoes. There are two variations of this dress, the first variation (above left) has large spots and we think this is the earlier version. The second variation (above right) has a smaller spots and a different white nylon lace trim. We have read some descriptions that say that the first version of this dress did not have a bow but we don't know whether the writers had evidence for this or just followed the photo in the Pedigree literature. As you can see the one above left does not have one. However the owner of this dress does not know whether it had one originally and whether it might just have fallen off. As you can see, we also have a photo of a large spot version which does have a bow and we have also seen this version MIP (Mint In Packet) with a bow. But if anyone has an MIP version without a bow we'd love to hear from them. Also we have read that the first version was wider. It is the case that the small spot version above is a narrower shape but again we have not checked enough examples to say whether this was truly the case or merely an accident of manufacture. If collectors have both versions we would be very interested to know what they have found regarding this point. A red cotton denim wrap-over shift dress which fastened at the front. This dress had short cap-sleeves and the edges of the dress including the neck and hem were bound in a printed cotton fabric with blue, yellow and red diamonds on a white background. A white cotton guipure lace flower with a red centre was affixed to the upper left shoulder of the dress. The dress fastened at the waist with one sewn-on metal snap fastener. There was a matching headband made of the printed cotton binding with a piece of elasticated cotton at the back. The outfit was shown with white Trendy shoes. This outfit was called 'Wrapover' in the 1975 Pedigree trade catalogue. A sweet little smock-type floral mini-dress with two rows of cotton covered elastic stitched just under the top of the yoke. The dress had a square neckline and short double-elasticated puff-sleeves. The top of the puff sleeves were also double-elasticated and formed the shoulders of the dress. Both the front and the back of the dress neckline, and also the lower edges of the sleeves were bound with a yellow stiff nylon trim. The dress opened down the back where it fastened with two sewn-on metal snap fasteners. It came with white trendy shoes. We have six variations of this dress, the one in the main photo we think most closely resembles the version shown in the 1974 Pedigree literature. The five other variations are shown in the photo below. We think there may be others and if you have any others, please do let us know. A long-sleeved floral cotton smock dress with a scooped V-neck. It had puff-sleeves with double elasticated cuffs, a high waist and a hem that was trimmed with white nylon lace. It opened down the back where it fastened with two sewn-on metal snap fasteners. Although the outfit was shown with white Trendy shoes, we have seen it MIP (Mint In Packet) with blue Trendy shoes. We have not seen the predominantly green, yellow, white and blue version shown in the 1974 Pedigree literature but we do know of two variations which were based on a blue floral pattern. The first had blue flowers with green centres, and indigo blue and white flowers with green leaves on a aqua blue background. The pattern of the second version looks very similar to one of the 1973 'Bridesmaid' dresses (see 1973 Sindy). This pattern had an aqua blue background decorated with white, turquoise and light blue flowers which had white, light blue and lime green centres. It also had lime green leaves and stalks. The lace differs slightly too. A yellow and white check gingham cotton shift mini-dress with wide half-length bell-shaped sleeves. The dress was tailored with two long darts down the front and it was trimmed with a blue rick rack around the neck and the edges of the sleeves. It opened down the back where it fastened with two sewn-on metal snap fasteners. We have it MIP (Mint In Packet) with white Trendy shoes, although we have heard that it was also packaged with blue Trendy shoes but we haven't seen this. Shown above are two variations. The first (left in main photo) has a cornflower blue rick rack trim and the dress is a pale yellow gingham. The second (right in main photo and shown MIP (Mint In Packet) has a sky blue rick rack trim and the gingham is a deeper yellow. This dress is almost identical in design to the 1973 'Fun Fashion' 'Long-sleeved Dress' (see 1973 Sindy). This long-sleeved shift mini-dress was made of blue patterned cotton with contrasting sleeves and turtle-neck made of white cotton. The pattern was a rich blue background decorated with small white bow shapes to give a geometric effect. There were two darts on the front of the dress from the breast to the hip shaping the dress and it was decorated with two gold beads affixed to the upper left shoulder of the dress. It fastened at the back of the neck with one sewn-on metal snap fastener. It came with blue trendy shoes. This outfit was not referenced in either the 1974 or 1975 Pedigree literature however it is shown on a Sindy relaxing in the 1975 Scenesetter photo of 'Pool Set' and also on an outfit box together with other 1975 outfits. We have this outfit MIP (Mint In Packet) in the old-style packaging with the 1974 style reference and so we are therefore showing it here. This outfit is very reminiscent of the 1940s and 50s Sun Suits. It was a halter neck play suit with wide culotte legs made of red and white polka dot cotton. It had long straps which tied behind Sindy's neck and the back of the waist was elasticated where it fastened together with one sewn-on metal snap fastener. It came with white daisy sandals. We think there may be three variations of the polka dot pattern, we have two that we can show you here. 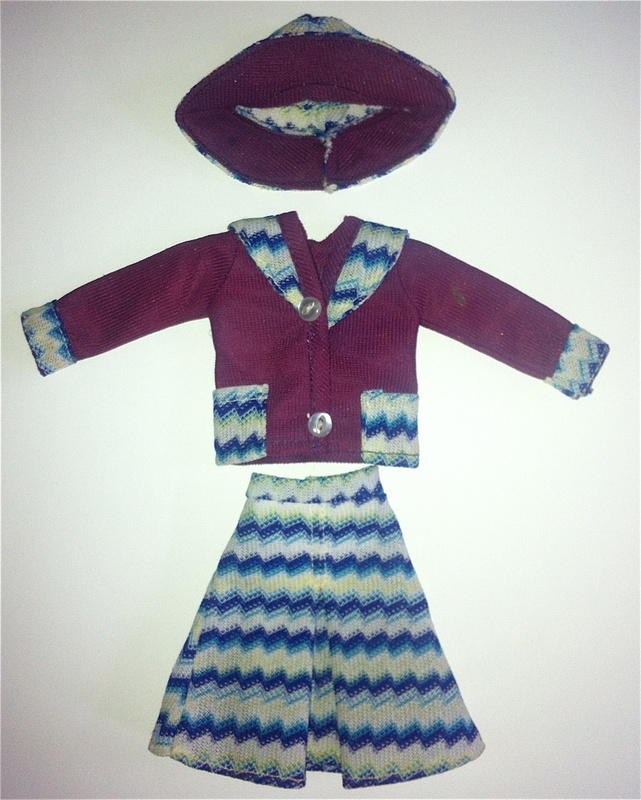 This outfit was reproduced for issue one of the Hachette Partworks magazine “The Wonderful World of Sindy” in 2007 and they do sometimes appear for sale as originals. The way that we tell them apart is that the Hachette version of the culottes has continuous halter neck straps, whereas the original halter neck straps were sewn onto the garment at the shoulder. Continuing on from 1973 the four Fun Fashions were now described as the Funtime Pocket Money Assortment. The two dresses and one of the skirts were updated slightly and are shown below. The Blue & Yellow Panel Skirt appeared to be unchanged (see also 1973 Sindy). The cotton fabric of this outfit was now shown as a cornflower blue floral trellis print decorated with pink, white & small deep blue flowers with pink & white centres and pink leaves & stems, but the dress design was still the same as 1973. This simple mini-dress was sleeveless, had a V-neck, and it fastened at the front with two sewn-on metal snap fasteners. By way of a trim, on top of each snap fastener there was a little white plastic button which was a different design to the 1973 version. Incidentally this fabric was also used for a variation of Sindy's 1970 'Day Dress' (see 1970 Sindy). The 1973 long-sleeved shift mini-dress was replaced by a sleeveless version. The skirt was still made of a red cotton however the dress now had a fitted bodice and only the front panel was made of the red and white criss-cross gingham cotton that had previously been used for the long sleeves and turtle-neck. It was still decorated with two gold beads but now they were affixed in the middle on the top of the bodice. It fastened at the back of the neck with sewn-on metal snap fastener. The simple knee-length A-line skirt made from a cornflower blue and white diagonally striped cotton fabric was very similar to the 1973 version however the diagonal pattern now slanted the other way and the white cotton bias band was now sewn around the top of the skirt forming a wide white waistband. It still fastened at the back of the waist with one sewn-on metal snap fastener. We would very much like to show this style of skirt on a Sindy and we would be pleased to hear from any collector who could help us (duly acknowledged of course). An additional outfit for Sindy came with the Scenesetter 'Horse' in 1974. It consisted of a black felted riding hat (which was smaller than the 1963 'Pony Club' version and it was felted inside and out rather than just on the outside), a long-sleeved buttercup yellow ribbed cotton turtle-neck jumper which fastened at the back of the neck with a sewn-on metal snap fastener and a pair of camel coloured jodhpurs made of a light cotton with smart turn-ups and a fly front opening which fastened with a sewn-on metal snap fastener. For her feet Sindy was given a pair of black plastic calf-length ankle boots (the same as used for 1971 'Jodhpurs & Sweater'). This scenesetter was called 'Sindy's Horse and Jodhpurs' in the style leaflet.